In the Chinese province of Qinghai, near the city of Haixi, a complex of 23 multi-energy plants is being built, combining different technologies to generate energy from renewable resources. The complex comprises a 188.5 m high tower of the 50-MW solar power plant whose support structure is expected to be completed in mid-2019. The solar power plant uses a modern CSP (Concentrated Solar Power) technology, which enables the storage of thermal solar energy, thus ensuring continuous power generation even at night. 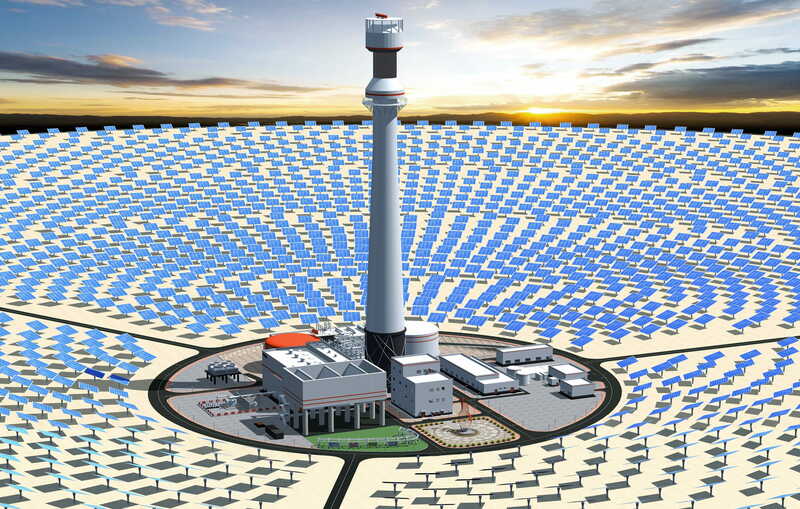 Using a system consisting of hundreds of mirrors, the sunlight is concentrated in a receiver located at the top of the tower. At the receiver, the absorbed solar energy is converted into thermal energy by heating the salt liquid (Molten Salt Liquid - MSL), which is then stored in a container for up to 12 hours. The steam that is heated by the MSL solution in the steam generator drives a turbine that powers the generator. The tower construction consists of a lower reinforced concrete part with a height of 147.5 m and a 41 m high steel construction of the solar receiver. 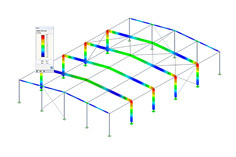 The design of the steel structure of the receiver was created in the RFEM program by the Czech company ALLCONS Industry s.r.o., a customer of Dlubal Software. 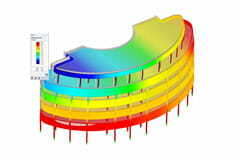 Since the solar power plant complex is located in an earthquake area high above sea level, where severe weather conditions prevail, it was quite challenging to design the steel structure. 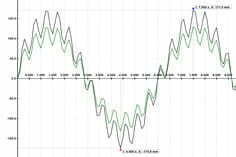 In addition, all calculations had to be performed according to Chinese standards. When designing the steel structure of the receiver, variable temperature conditions at the receiver had to be taken into account, because the solar panels' surfaces are exposed to a heat flux in sunlight that is 1000 times larger than the normal solar flux. 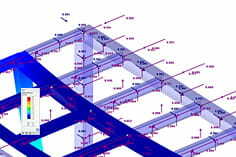 To ensure a smooth expansion between the steel and concrete parts of the structure, a special multi-level anchoring system has been developed to allow movement of the structure in the radial direction. 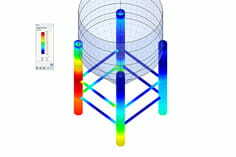 With regard to the height and cylindrical shape of the tower, it was necessary to also take the wind load into account, which may result in a transverse vibration due to wind turbulences. 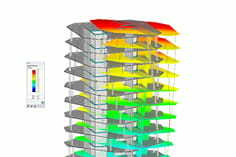 Calculations on the effects of wind and seismicity were performed on a complete tower model in RFEM, which is why a close cooperation with the Chinese team that designed the lower concrete part of the tower was necessary. Thanks to the good mutual cooperation, it was possible to reach an agreement in the results of both teams with a maximum deviation of 1%.